Kaduna is one of the States in Nigeria that has witnessed disastrous flood where people lost their lives and property. This usually happen between July and September when the state experience torrential rainfall and opening of dams in neighbouring countries. Flood according to one of the World’s environmental analysts, John Milton, is overflow of water from a lake or other body of water due to excessive rainfall or other input, usually disastrous. In Kaduna, records showed that the state experience flood for the first time in 1963 and then 1973, 1983, 1993, 2003 in what experts called ten year return period. But, that has changed as flood now occur in the state virtually on yearly basis though with varying degrees of consequences due to increase human activities as a result of population explosion. 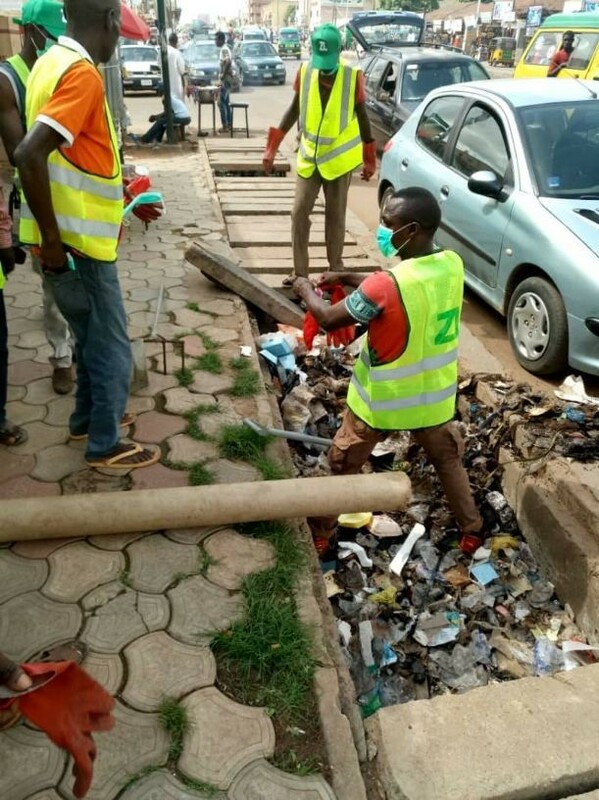 In other to avoid a repeat of flood and cholera outbreak in the State, Kaduna State government through solid waste management company, ZL Global Alliance had began early desilting and disinfection of drains in major towns across the state. The company had earlier desilted Kaduna rivers which eventually prevented the state from witnessing flood disaster during the last raining season as it was the case before then. Managing Director and Chief Executive Officer, ZL Global Alliance, Dr (Mrs) Abiola Bashorun, reiterated that, her company was only complementing the efforts of the state government under Governor Nasir El-Rufai. According to her, the exercise became necessary to ensure free flow of water into River Kaduna. The Company apart from its contractual terms with the state government, was working in line with the plans by Governor Nasir El-Rufai to free Kaduna from perennial flood and disease outbreak aiming at preventing people resident in the state from out-of-pocket medical bills. “We are starting this desilting exercise from Leventis roundabout through Ibrahim Taiwo road, Kano road, Kontagora road, Jos road, Katsina roundabout, Lagos roundabout to terminate at River Kaduna by Stadium roundabout. “We are not doing this only here in Kaduna, but the exercise will be taking place simultaneously in Kaduna city, Sabon Tasha in Chikun local government and Zaria. It is a development we are committed to not only as waste management company, but as citizens and occupants of Kaduna State. “The essence is to remove anything that can stop free flow of water through drains. This will continue in the next few days. We are targeting all the major roads in Kaduna including Constitution and Independence roads. “It is important to add that, this is not part of our job as key waste management service provider engaged by the state government, but we are trying to be proactive especially with the heavy rainfall we are experiencing now. It is part of our corporate social responsibility to the good people of Kaduna State. “As we are doing this, we also engage locals on sensitization, showing them the best way they can manage their refuse without pouring them in the drains and expect erosion to carry it away. It will do but at detriment of others. We have designated spot for the people to drop their well packed refuse to make it easy for our mobile trucks to evacuate the refuse to nearby designated dump site. “People should avoid dumping refuse in gutters because it will still come back to them. Some people are fond of doing that once they see rain coming. Like i said, even if it temporarily move away from your own house, it will get stocked at someone else’s house and it can cause flood and disease outbreaks. “As we are doing our work, we are disinfecting along the line. So, it is like three in one exercise for us and we are happy we are doing these”, she added. Commenting on this development, a former Director of Centre for Disaster Risk Management and Management Studies, Ahmadu Bello University, Zaria, Kaduna State, Professor Edwin Iguisi harped on massive awareness campaigns to address the scourge. To him, “public enlightenment is important because people’s attitude to refuse disposal is appalling. Where people dump their waste in drains without considering consequences of their action. We have seen some of the effect of this. So, we need to work on that attitude. “Yes, the solid waste company is trying its best to get the work done base on the understanding it had with its employer which in this case is Kaduna State Government. That was good. Any effort targeted at reducing flood issue anywhere in the world should be commended and supported where necessary. “But beyond that, I think what government should do is to enforce regulations on master plan. People who built where they are not suppose to build on should be corrected. The enforcement agency must insist on doing the right thing come what may. That political will must be there. I know the state has a master plan. If that is not adhered to by developers, the enforcers should rise and enforce which I see as ultimate solution to this problem”, added the Prof. Responding to what the state government was doing to check flood, Commissioner of Environment and Natural Resources, Amina Dyeris Sijuwade said, the state government was planning to construct more drains between the last six month of the year and next year. According to her, the construction work which started sometime ago was stopped due to some hitches experienced. She said, “in 2017, the state government embarked on construction of additional drainage system in the three metropolitan cities of Kaduna, Kafanchan and Zaria which helped us to check flood that year. “There is still challenge in this area. The intention is to continue with this project by the middle of the year towards next year. We believe this has helped us to control flood and we need to do more of it. “In addition, in conjunction with our Environmental Protection Authority (KEPA), we periodically conduct sensitisation campaign on our communities on proper waste disposal because that is the big contributor to incidences of flooding especially in the city which we shall continue to do. “In rural areas, what we try to do through informal manner is to tell them what to do. The ministry is working with ecological funding not in construction but in preliminary in addressing flood affected area”, she added.